Reduce is listed first because it’s the most important “R.” Reducing consumption of natural resources reduces the demand and environmental impact caused during the extraction processes. Let’s face it: school cafeterias generate a huge amount of trash. 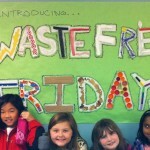 Teach your students and staff the importance of waste reduction by implementing a comprehensive recycling program and encouraging waste-free lunches. The first step is to check with your current district waste provider and ask about adding a recycling service for your school. Many include a comprehensive recycling program, and all you have to do is set up a separate recycle collection bin with clear, pictured signs showing exactly what CAN GO IN THE BIN. NOTE regarding Terracycle Brigades: although well-intentioned, this confuses kids and causes contamination in recycling. These uncommon items like juice boxes and snack bags do not actually get recycled; they get repurposed into pencil pouches and backpacks. I feel that efforts to educate and avoid using non-recyclable materials are best. 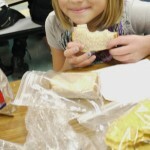 Check out the Waste-Free page to share with families interested in packing waste-free lunches. Interested in more tips for the home? CLICK HERE.